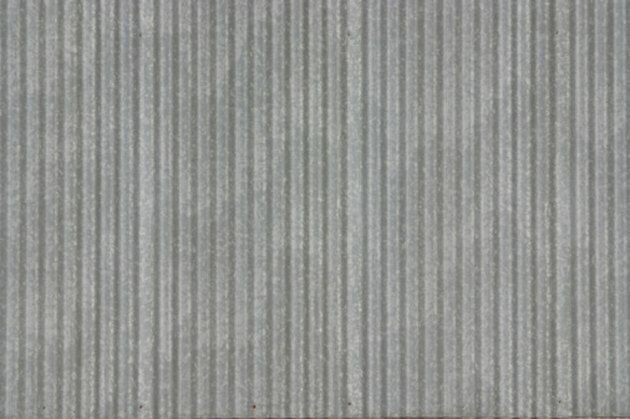 Corrugated roofing is generally used on commercial buildings and in rural areas as roofs for barns or sheds. Metal roofing is an alternative to the more commonly used shingle roofs and can be installed quicker and easier than those roofs. Installing corrugated steel roofing is easier on the back and more convenient to handle than the heavier shingles needed on conventional roofs. Measure the ridge of the roof to determine how many panels will be needed for installation. Run a tape measure across the front of the roof and record the measurement. Divide by the width of the panel to determine how many will be needed for installation. Measure from the top of the roof down to the ridge and divide by six which is the height of the metal panel to determine how many columns will be necessary. Multiply the number of rows by the number of columns to get the number of panels that will be needed. Line up the first panel at the bottom corner of the roof near the lip and hammer it in place with 3-inch metal roofing nails. Insert about 20 nails into the humps of the ridges spread equally throughout the panel. Line up the second sheet overlapping the first by one ridge and install it in the same manner. Set the third piece in place and continue until all of the first row has been installed. Cut the last piece to size if necessary with a circular saw and a carbide tip. Mark where the cut will be made and carefully cut through the piece. Insert the ridge cap along the bottom edge of the panel. Curve them over the lip of the roof and secure the 6-foot pieces in place with 40 roofing nails on each cap. Install the second row directly above the first in the exact same manner as the previous row and continue until all the steel roofing panels have been installed. Install the ridge caps along the top of the panels and around the rest of the perimeter the same way they were installed in the previous step.